Naruto Movie 4 is made specifically to cater to all the Naruto fans out there, just like what you’d expect from a naruto movie. So non-Naruto fans shouldn’t really expect to enjoy this, as much. The story this time round is about; a group of rogue ninjas who decided to revive a Demon spirit, which could destroy the world if reunited with its body. The only way to prevent this is for the shrine maiden (Shion) to go and reseal the demon, so Team 7 (Naruto, Sakura, Rock Lee & Neji) are tasked to protect her. Just like all the previous Naruto movies this one uses the same formula; of them having to protect someone of great importance, getting to know said person and have intense battles along the way. But not only is the actual story somewhat interesting, but the underlying-plot about Shion able to predict people’s deaths helps spice things up a bit. As I’ve stated earlier, the characters this time round are: Naruto, Sakura, Rock Lee & Neji. If you’ve been watching Naruto Shippuuden then you’d know what to expect from them but like always Naruto is the main focus and he’s annoyingly stupid as usual until, later on. Like always it does do the whole Naruto relating himself to the main character thing but Shion proves to be a fairly in-depth character herself, so it can be forgiven. The bad guys this time are rather imaginative (drug users) but there’s no real reasoning given towards their actions. This being a movie, high production values are expected and that is exactly what is given. Fluidly animated action sequences, great lighting effects and interactive environments. However it’s easy to tell that some corners were cut in places; like the CG army and fire effects. The music is pretty awesome and matches the moods well but the soundtrack will give the feeling that you’ve heard it before. But one thing no one has heard before is the hilarious ED theme. Overall this as a typical Naruto Movie that gives the initial feeling of all previous ones, however it’s able to provide a highly entertaining experience. My scoring may be somewhat biased, seeing how I am a Naruto fan, but this is truly an enjoyable movie to watch and probably the best Naruto Movie yet. But expect to see the usual cheesy ending... (this time it’s a Spirit Bomb). 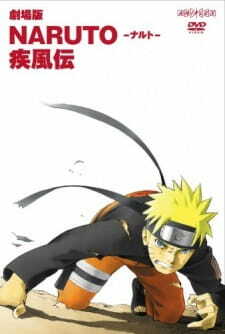 The story is so typical to Naruto, it made me sick. I suppose that the over all plot of the story ( preistess, demon, army of stone warriors, destruction of world) wasn't so bad, compared to the ending. I won't say what happens, but if anyone has a deep hatred for brand new super powered attacks that instantly make everything better, DO NOT WATCH. I always feel that the artists for Naruto do a really great job with everything they do. While the writers....must smoke crack or somthing. Naruto fans, rejoice. What Gekijouban Naruto Shippuuden offers is a healthy dose of your favorite Naruto recipe. Of course, that also means it's nothing new or groundbreaking. Simply put, if you like Naruto, then you'll probably like the movie. If you're not particularly fond of the show, then don't expect too much. The plot behind the movie is one that is highly unoriginal and rather rushed. The story lacks much depth, and consists of the usual, ultimate evil threatens the world, Naruto &amp; co. get assigned to bodyguard work, they face other ninjas, almost face defeat, but then Naruto always comes through and saves the day. Or does he? The very beginning of the film gives a preview (I don't consider this a SPOILER since it happens within the first two minutes of the movie) of Naruto's death, and subsequent funeral. Ooh, suspense, suspense! Anyway, if this isn't enough to keep Naruto fans hooked, then the high number of action scenes will. In fact, the action scenes are the only redeeming quality to the movie, as the story suffers from almost no development at all. It's your basic high action, little story formula that's perfect for satisfying the series' generally younger audience. The Scooby gang is switched up a little for world-saving action. Of course, Team 7 consists of Naruto and Sakura, but this time around, Rock Lee is filling in for Sasuke, and Neji in place of Kakashi, since all of the upper level ninja are tasked with stopping the massive ghost army. This is where the story falls apart. The lame excuse for having just Team 7 guard the most key person to saving the world really makes no sense. Why send all the more experienced ninja to stop this army (they end up doing no damage at all to them anyway), and furthermore, Naruto dispatches them easily enough on his own. Also, is it just Wind Village vs. ultimate evil? You'd think that at least a few other people would care a little. The resolution will most likely have many people shaking their heads in disbelief at the sheer number of deus ex machina that end up saving the world - since there are no rules regarding Shion and the demon, they can just more or less make it up along the way. That aside, it's a good way to isolate Naruto, Rock Lee, Sakura, and Neji, and focus the action upon them. Their fights with various other ninjas and a few more sentimental moments provide just enough substance to consider this a movie. The ending will also probably have you smiling with it's tongue-in-cheek humor, and the ED song before it is rather enjoyable as well. As usual, Naruto performs quite well in the art department. Unique characters, flashy jutsu effects, and detailed backgrounds are pleasing to the eye. A few corners are cut in places (most notably the ghost army, although this is understandable), but it's easily overlooked. Action scenes are fluid and well-paced, and fit perfectly into the movie. Like it's art, the sound is similarly of great quality. The upbeat music playing during action scenes will have your blood pumping and fit the fights really well. Various sound effects, such as the sounds of kunai or the rush of running water are executed in great fashion. The ending song is pretty catchy as well. Sound is basically what you've come to expect from the series. What Gekijouban Naruto Shippuuden offers character-wise is really nothing new. Some of your old favorites, plus one or two new heroes and several baddies. Shion possesses just enough development to keep the story going, while most of the baddies, such as the four ninja siblings have no back-story at all, and are just thrown in to give Team 7 a tough fight or two, although they do possess some rather unique abilities with their use of chakra. The movie makes no leaps or bounds in anything new this time around, but it's enough. Perhaps it's just me being reminiscent of my younger days of watching InuYasha movies, but Gekijouban Naruto Shippuuden reminded me of them, and it was kind of nice watching something less story-based and just purely action-driven for a change. If you're a fan of action, you'll enjoy it, more or less. Even if you're unfamiliar with the Naruto world, you shouldn't have too much trouble understanding this movie. As stated before, Gekijouban Naruto Shippuuden offers nothing new to the Naruto world, and as such, don't go in expecting too much. If you've been watching the Naruto series up until now, then of course watch this movie. Chances are, you'll like it. If you aren't particularly a fan of this anime, then don't expect the movie to change your mind. Overall, the movie is just a concentrated dose of Naruto action geared at younger audiences. Naruto Movie 4 is a stereotypical Naruto movie. This over-hyped movie portrays Naruto dying in the trailer, although this is nothing more than something to think about for all of 2 minutes. On top of that, the plot is about predictable as any of the other Naruto movies; Naruto meets brat, brat hates Naruto, Naruto is very similar to brat, they become friends, Naruto protects brat, Ultimate Resengan, and then the end. Other than that minor crack in the 5-story Naruto Obelisk, this movie isn&rsquo;t so bad in terms of graphics, story, and sound. No matter how conventional the plot is, I always loose myself in these surprisingly enjoyable movies. This is definitely something to watch for all Naruto Fans. I would watch this installment of Naruto Movie 4 after you understand the changes in the characters in the Shippuuden series, because apparently the only knowledge you need for this movie is the fact that Naruto trained with Jiraya.